To support the next stage in the transformation of Temple University, President Ann Weaver Hart has appointed Vice President William Bergman, a 13-year veteran of the university, as the chief of staff. Bergman came to Temple in 1996 after 27 years with the Philadelphia Police Department, where he served as chief inspector of the Detective Bureau, chief inspector of the Communications Bureau and Deputy Police Commissioner, to oversee the universitys public safety operation. He rose through the universitys senior management ranks and became vice president of operations and business services in 1999. “This is a tremendous honor. Temple has grown and improved in recent years, and we need to keep the forward momentum going. 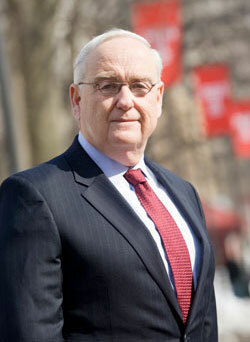 I look forward to being part of Temple’s progress in the next decade,” said Bergman. As chief of staff to the president, Bergman will join the President’s Cabinet, which consists of Executive Vice President and Provost Lisa Staiano-Coico, Senior Executive Vice President of Health Sciences Edmond Notebaert, Senior Vice President and General Counsel George Moore, Senior Vice President, Chief Financial Officer and Treasurer Anthony Wagner, Senior Vice President for Institutional Advancement David Unruh and Senior Vice President for Government, Community and Public Affairs Kenneth Lawrence. The successful completion of the “Access to Excellence” campaign at the end of 2009. The university’s first comprehensive campaign raised more than $380 million in gifts and commitments, well above the $350 million goal. The recent appointment of Unruh to head Temple’s fund-raising and alumni relations efforts marks the university’s commitment to continuing to build private philanthropic supports for its ambitious agenda. Completion of the Academic Strategic Compass after 18 months of collaboration — a process that pooled the collective insight of hundreds of faculty members, administrators and students. The Academic Strategic Compass has four main areas of emphasis (opportunities for student success; research excellence; metro-engagement; and global commitment) focusing on making Temple University a “destination campus” — an institution that attracts talented and aspiring students to enroll and outstanding scholars and teachers to join Temple’s faculty. Creation of a framework for campus development that supports the goals of the Academic Compass and will make “Destination Temple” a reality. That framework, Temple 20/20, is the result of a year-long process involving a 28-member steering committee representing the university’s academic, professional and student leadership. In addition, numerous small group and town hall meetings were held to solicit ideas and feedback during the process. Recognizing the plan’s potential for North Philadelphia, local elected and community members were also asked for their ideas and reactions to the plan. Temple 20/20 is already being implemented with plans moving forward on an enhancement of Pearson and McGonigle Halls, and the development of a student residential complex at Broad and Oxford streets. Bills leadership has been essential in the development of the Temple 20/20 framework and in guiding the $500 million in construction improvements completed over the last five years. The next stage in the realization of Temples academic aspirations will require leadership and expertise at the highest levels in order to vigilantly align the academic strategic plan with campus development, Hart said. The departments in Bergmans portfolio will be reorganized under Wagner, to whom Bergman previously reported. During the next two weeks, Bergman will coordinate the leadership team transition with Chief of Staff Melissa Birnbaum Coopersmith as she prepares to leave the university at the end of February.